A whole golden, succulent roast turkey: a showstopping centrepiece. Our birds are the much-celebrated Bronze breed. Slow-grown, organic and free range, they have juicy meat that’s full of flavour – and we include the giblets so you can top it off with the absolute best proper gravy. Feeds 9-10 generously with plenty of leftovers (300g of cooked meat per serving). Minimum weight 5kg. 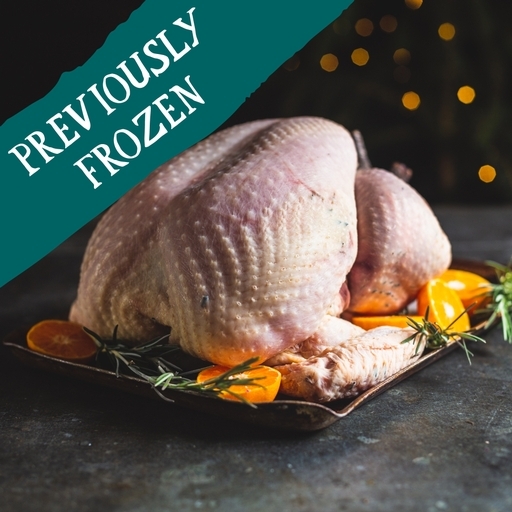 Our whole organic turkeys have been previously frozen, so will not be suitable for home freezing. Keep in the fridge, below 5°C, and use by the date on the label, or freeze on day of delivery. Defrost thoroughly before cooking. Do not refreeze once thawed. For our turkeys and turkey joints, we allow 300g of cooked meat per serving. This allows a generous 200g each for dinner, plus plenty of leftovers for sandwiches, curry or whatever takes your fancy. Our year round whole chicken serving sizes allow 200g cooked meat per person, which makes a generous meal but doesn’t allow for leftovers in the same way.